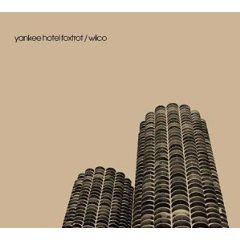 Never been a big fan of Wilco, they never seemed to be much more than OK. Kind of interesting indie-alt-country/folk people, something that I'm actually predisposed to like but that in the case of Wilco never rocked my boat. This is the best album they've had here, and while it does not rock my world or shatter my preconceptions about them it is indeed a very good album. It is only let down by tracks that are overly poppy like Kamera, which really make the band sound a lot less unique that it shows itself elsewhere in the album. Where the album pays off is in the tracks which are slightly more subdued, using a lot of background hisses and noises which give it an otherworldly quality which really enhances the album. In the end it rewards repeated listenings and is indeed a very good album, and something I'll want to listen to again. Jeff Tweedy (vocals, guitar), Jay Bennett (guitar, keyboards, vocals, drums, bass), John Stirratt (bass guitar), and Ken Coomer were responsible for the conception of the album. Leroy Bach and Fred Lonberg-Holm provided additional instrumentation. Coomer is listed as a "collaborator", since his drum parts were replaced by those of Glenn Kotche. Bennett, Chris Brickley, and Jim O'Rourke provided engineering and mixing and Steve Rooke mastered the tapes. Wilco is named as the producer of the album, and Sam Jones took the photographs that were used in the insert of the album.